New Bern. This website will allow you to search for homes, learn about the New Bern Real Estate Market, and much more. If you have any questions contact Steve or Jana J. Today! Steve and Jana Tyson sold over $50 million of Real Estate in the past 2 years and over $150 million in the past 10 years. They know the local Real Estate Market like no one else. The Tyson Group are "Leading The Market, Sign up to Sign Down". Steve and Jana Tyson were very helpful in our home buying decision. They were not at all pushy and listened to what my wife and my priorities were in looking for a new house. We would strongly recommend them to any new home buyer or seller in the Craven County area. What makes New Bern such a great place to live? Many things, but most of all it is the people. People from all walks of life and from all parts of the country. Many people that have moved here give back to the community by volunteering for one of the many non profits that work to make the world a better place to live. The hospital alone has over 400 volunteers. The folks moving here have a wide range of interest. As a result New Bern has a taste of cultural experiences that you would normally only find in a larger metropolitan area. Whether it is music, theatre, fishing, antique cars, computers, astronomy, bridge, tennis, whatever your hobbies might be, you are sure to find others that share your passion. Click here to see a list of clubs, organizations, and non profits in New Bern, and the surrounding area. New Bern is known nationally as a great place to call home. Read what others are saying about the area. Culture Trip-Most beautiful town in N.C.
10 Coastal Towns where you can afford to retire. Why you must visit this coastal NC Town. You don't want to miss this coastal town. 10 best boating cities to retire, play, and thrive. Union Point Park, shown above, is located in historic downtown New Bern. 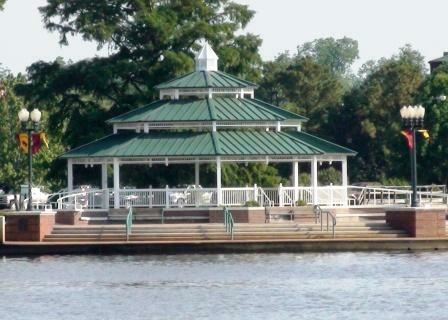 New Bern has 3 other Parks that give you access to the rivers. Union Point is where the Trent and Neuse Rivers converge and form the widest river in the United States. Sailing, boating, and fishing are among the favorite pastimes in New Bern. The beautiful rivers and close proximity to the beaches of Eastern NC are just a few of the many reasons so many folks find New Bern an attractive retirement destination. A note to thank you for all your efforts on our behalf. I can't imagine going through all that paperwork every day. Everything happened just as you said it would and you kept us on schledule. We really appreciate all you have done for us. Once again, thanks for everything. Keep scrolling down to learn more about why New Bern NC is a great place to call home. New Bern was settled in 1710 and is rich in history. The downtown area has many homes and buildings of historic significance and is considered the finest historical district in North Carolina. Click on the History links, on the links bar, to learn more about the history of New Bern. Of course everyone must see the Tryon Palace while they visit New Bern. New Bern was the colonial capital of North Carolina and the governor's mansion was located here. Click on the picture of the Tryon Palace for more information. The NC History Museum is a must see while in New Bern. Click Here for more information on the Tryon Palace History Museum. New Bern, is located about 35 minutes from the Atlantic Ocean. Marine Corp Air Station Cherry Point is only 20 minutes away. The Pamlico Sound, which has the big water required for serious sailors, is 20 or so miles away. New Bern is centrally located between Florida and the northeastern. If you are from the Northeast it is a day trip back home not a 2.5 day trip like it is from Southern Florida. We have 4 seasons and not just 1 long hot summer like Florida. New Bern NC has an exceptional regional airport with daily direct flights to Atlanta and Charlotte. You can get to the Atlanta or Charlotte Airports from anywhere, and then its a 1 hour jump to New Bern. Click on the Airplane to get information on flights to and from New Bern. Located just across the Trent River from downtown it is just minutes away from most of the neighborhoods. Coastal Carolina Regional Airport was recently named one of the top 10 stress free airports in the country. 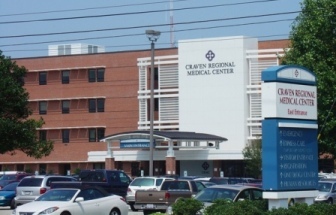 New Bern has an excellent regional hospital with over 340 beds and 200 physicians. In 2016 Carolina East Medical Center was rated the 3th best hospital in N.C. by Carolina Business Magizine. They have a comprehensive heart center that performs coronary bypass and catheterization that recently rated amoung the top 50 Cardic Centers in the U.S. Currently under construction is a compresensive Cancer Center that when completed will give New Bernians access to world class cancer treatment without leaving the area. In addition they have dedicated units for, intensive care, women's care, and pediatric care. The diagnostic center provides radiography, MRI, CT scanning, stereotactic mammography, bone densitometry and many other test. Click the link below for more information on Carolina East Medical Center. Remodel an existing home? Or buy a new home? You love New Bern-You love the house, but it needs a larger master bedroom and a Carolina room. Can one be added to this home? How much would this cost? We will be glad to give you professional input about remodeling an existing home or building a new home. In addition to being a Real Estate Broker Steve has been a licensed General Contractor since 1982. During his career as a homebuilder he built or remodeled over 250 homes. His expert opinion could save you a lot of headache and even better, it is free.